I won't be able to make tonight's festivities in the Green Dragon but hope you all have a good time. It is Friday. And every Friday is Green Dragon Friday! So... once more to the inn, dear hobbits, once more! Anyway, it is Friday, which means, as usual, Green Dragon Friday! 8PM GMT in Bywater, welcome hobbits! Another great Green Dragon Friday hosted by Master Simbo in the absence of Miss Lina. Music from at least three new players and a few tunes from some of the regulars made for some good dancing. It is Friday again, and it'll be another hobbit inn night in Bywater! Full of news and music, dancing and drinking, and whatever else we can think of! As always, keep the general event guidelines in the first post of the thread in mind if yer plan to participate. Welcome hobbits! A yule-themed Green Dragon Friday! Hobbits all over are invited to celebrate yule Bywater style! And if yer have yule-themed music, stories, poetry or similar yer would like to perform, don't hesitate to sign up! Yule is an important celebration for hobbits, which the amount of yule parties recently certainly shows. Even though many hobbits stay home with their family and loved ones during the yule days, quite a few want to meet with their friends as usual. So it is no big surprise that Barmy over at the Green Dragon wants to get in on the yule festivities this year (not least since he closed the inn for renovations last year, and lost much in the way of coin because the regulars went to the Bird and Baby instead). Oh, and plans are afoot fer the Green Dragon end of year party as well, December 30th! This is Green Dragon Friday, but with a yule-ish theme to it. Usual guidelines apply, which means that this is a hobbit-preferred event, with a few traveling dwarves welcome. If yer know yer have some entertainment to offer the crowds, send a message or sign up during the night. We'll try to add in as much as possible within the regular two-hour duration of the event. The Green Dragon yule party tonight, then, 8PM GMT in Bywater! Welcome hobbits, and bring some yule time cheer with yer! And what an excellent party it was, with much fine music, stories, poems and dancing! Here is a poem in honour of the fine event. To Barmy's little humble Inn? Across the creaking wooden floor? At which we stare with child's delight? And my, it is a warming fire! Is all the lovely company! What makes this place is you! And you! Just remember, no bagpipes allowed! Bonkadoc sips on his freshly squeezed turnip juice, sighs contendedly and raises the glass, happy holidays to all! GDF/Hobbit End of Year party at the Plough and Stars! It is Green Dragon Friday! But in Brockenborings! And with an end of year theme! Barmy currently keeps the Green Dragon closed to clean up after the GDF yule party, so this coming Friday we'll be at the Plough and Stars in Brockenborings instead! 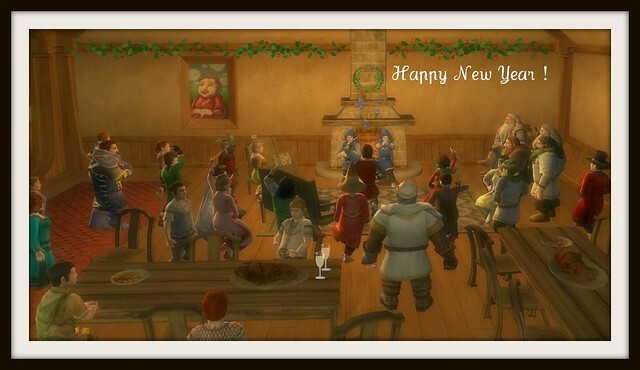 And there are no better hobbits to greet the new year with than yer fellow Brockenborians! So come greet the new year and the coming brighter days with us! Bring a tale, a song, a poem, a riddle or something similar, if yer have fireworks that's grand too (fer use outside), and we will have us a party worth remembering! This looks like real fun. I enjoyed RP Events, especially most with hobbits before on the german RP server, but however not in English yet. Just came here with some international friends. As I've read the first post, I see this is for hobbits only, and an exception for dwarves. But what if, lets say, a group of 4 - 6 dwarves comes a long. Would that ruin something or would you very welcome it. Saw on some pages before that 1 or 2 dwarves joined and were welcomed. Not that you would feel uncomfortable if suddenly the tavern is full of dwarves. We are not sure if we turn up though, but we would be interested at all. Just wanted to ask. Dwarves have always been welcomed. It's not just for hobbits at all. When I began this event way back whenever it was, I fully hoped that Dwarves would show up, I mean they look great there smoking their pipes and showing off their beards. Travelling Dwarves, hobbits and hobbit residents was my vision. It's just the Elves and the race of men that literally don't fit in with it all, so it is encouraged they roll a hobbit/dwarf for the night, thus getting more RP as a result. Not that i'm in charge anymore! But i'm sure the event is run exactly as it always was. I'll get back to Star Wars now 0_^ Have fun! And all the best to the hobbits of Green Dragon. This looks like real fun. It is, one of the best events in my opinion! But what if, lets say, a group of 4 - 6 dwarves comes a long. Would that ruin something or would you very welcome it. This does seem like a lot of fun! I need to find my way to the event and I should be there. I'm new-ish to the game. Of course yer should! A warm welcome to yer! Just remember, we're in the Plough and Stars/Brockenborings this coming Friday, then back at the Green Dragon from the new year on! Had the pleasure of attending tonight, thouroughly enjoyed it and felt most welcome (Even as a Dwarf). I hope to attend these more often, and i should expect you'll be seeing more of me and perhaps those of my kin. The Lonely Mountain Minstrels were present as well. I think the hobbits were quite surprised when we started playing music and even one of us danced. We also drank a lot and went loud, but well we're dwarves. And grand it was ter have ye with us Master Miworin - more so once yer'd stopped shouting and bashing inter folk dancing an scaring poor wee Yllisa. Dwarves ye may be, but there were no need fer that at the start. Happy New﻿ Year! May 2012 bring good tidings, great health, wealth and prosperity , and PEACE to everyone! Thank yer all who came! (minus the one griefer, but less said about that the better *smiles*) I hope yer enjoyed the party! It was quite grand and lively! A warm thank yer to those who have posted pictures from the night! A few more pictures, plus one of the song lyrics, can be found here. The coming Friday we'll be back at the Green Dragon in Bywater, as per usual. In the meantime, a happy new year everyone, strangers and friends, both present and absent! I had a wonderful time. I wish I could attend more often, but I am from your former colony of Massachusettes and my timezone does not mesh. I was on vacation so was able to attend... I hope to be able to more in the new year. Would a merry group of mihril guards be welcome at this fine event?